Description: Infrared light pickup system with piezo elements. Power requirements: 18-volt NiMH battery. Master volume control. Controls the overall volume level of optical and piezo pickups. Turning the control clockwise raises the volume. Turning the control counterclockwise lowers the volume. Bass control. 12dB boost or cut of bass. Turning the control clockwise boosts the bass. Turning the control counterclockwise cuts the bass. The detent, or “click,” in the center of the control is the “flat” position, zero boost or cut. Midrange control. 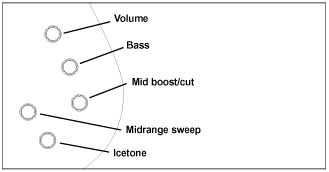 12dB boost or cut of midrange at a frequency selected by the mid sweep control. Turning the control clockwise boosts the mids. Turning the control counterclockwise cuts the mids. The detent, or “click,” in the center of the control is the “flat” position, zero boost or cut. Midrange sweep control. Provides a variable Q that is narrow in the low frequencies and increasingly broad in the higher frequencies. Turning the control from the fully counterclockwise position to the fully clockwise position references (sweeps) frequencies from 200 Hz to 1,000 Hz. The detent, or “click,” in the center of the knob’s rotation sets the sweep at approximately 450 Hz. Rotate this control in either direction to sweep the frequency band until you find the desired frequency to boost or cut. 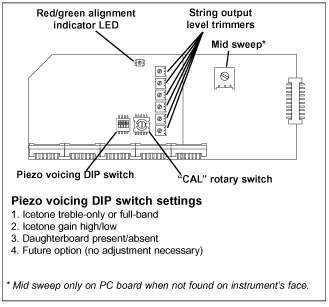 Piezo (Icetone) control. Allows the blending of the signal from the piezo elements (built into the individual monoliths) with the optical signal. Adding Icetone enhances presence and brightness. Turning the control clockwise increases the amount of piezo signal, while turning the control counterclockwise reduces the amount of piezo signal. Icetone cannot be selected separately. Power status LED. This red LED illuminates when a 1/4" plug is inserted into the output jack. This indicates the system is powered on. The battery typically provides 15 hours of playing time on a single charge. Note: Two hours of playing time remain after this LED goes dark. Power management LED. Located on the rear cover plate. Operates only when charger is plugged in. Red indicates that the battery is charging. Green indicates a full charge. A full charge is achieved in one hour. Note: It is a normal function of this LED to show red each time the charger is plugged in, even if the battery has just been charged. Charger jack. Insert the wall charger’s output plug here to recharge the internal NiMH battery or to use the AC power adapter while playing. This system utilizes a beam of infrared light to sense string vibration, so proper string/light-receptor alignment is necessary for optimum performance. Calibration of the system is typically required when new strings are installed or when the playing action is modified. Note: Adjust the string height (action) and set the intonation before calibrating the system. 1. Remove the rear cover plate and plug in a 1/4" cable to turn on the Lightwave system. No amplifier connection should be made. 2. With a 2mm flat-blade screwdriver, carefully rotate the Motherboard’s “CAL” rotary switch position from “0” to the first string to be adjusted. The order does not matter. Note: The “CAL” switch position #1 is for the highest string. 3. Hold the bass in the approximate playing position, and with a .050" hex driver, rotate the optical adjustment hex screw (found on the top of the Monolith structure) clockwise, until the alignment LED turns red. Then turn it counterclockwise until the alignment LED turns green. This will confirm you are in the correct adjustment range. Note: If you do not achieve both colors lit, this does not necessarily indicate a problem. It likely means that the string saddle height is at or close to the very limit position. 4. Rotate the hex screw clockwise until the LED no longer shows green (or counterclockwise until the LED no longer shows red), and continue for approximately 1/8th turn. This should leave the hex screw set between the red and green positions, with the LED not glowing. 5. Repeat above steps 2 and 3 for the remaining strings, one at a time. Saddle height. With a large flat-blade screwdriver, rotate the saddle slug in half-turn increments—clockwise for lower action, counterclockwise for higher, until the desired string action is achieved. (Each half-turn raises or lowers the action by 1/32".) Align the rotations so the string saddle channel is accurately parallel with the string path.Preliminary Optical Alignment. Using a .050" hex driver, rotate the Monolith’s optical adjustment hex screw clockwise for up and counterclockwise for down, until the Infrared light emitter LED is approximately parallel with the string. This will assure that the string is in the approximate position for final zeroing of the optics. Intonation. Proper string intonation is achieved by manually shifting each complete monolith structure either towards the nut (for a flat pitch reading at the 12th fret) or away from the nut (for a sharp pitch reading at the 12th fret). This adjustment is made with the string loosened prior to moving the Monolith structure.